On June 19, 1936 the Brown Bomber Joe Louis climbed through the ropes at the Yankee Stadium in New York to face German heavyweight contender Max Schmeling in front of a sell-out crowd to contest a non-title bout scheduled for 15 rounds. Louis was just 22 when he faced Schmeling for the first time, undefeated in 24 fights. Schmeling had already won and lost the world title and at 30 was felt to be easy pickings for his much younger and more complete opponent, who was already on the way to establishing the legend he was destined to become. The onward march of fascism in Europe was the backdrop to the fight. Adolf Hitler had been in power in Germany for three years, Italian dictator Benito Mussolini was intent on reliving the glory days of the Roman empire and Spain was embroiled in a brutal civil war which foreshadowed the cataclysm that was to engulf Europe and the world just a few years later. Meanwhile, the United States regarded itself as the home of freedom and democracy, even though for young black men like Joe Louis it was closer to hell, with lynchings still a regular occurrence in parts of the south and blacks treated as second-class citizens even in areas without formal segregation. The fight itself proved that Schmeling’s claim to have identified a flaw in the Brown Bomber’s style was not mere hyperbole. Louis had a habit of lowering his left hand after jabbing with it, which Schmeling aimed to exploit with right hands. The German dropped Louis to the canvas for the first time in his career with just such a right hand in the fourth round and by the time he finally knocked him out in the 12th he was ahead on all three of the judges’ scorecards. It was a major upset. In black communities throughout the US Louis’ first defeat was met with huge consternation by people who saw in him their savior and hope. Meanwhile, after a personal message from Hitler congratulating him, Schmeling told a German reporter: “At this moment I have to tell Germany, I have to report to the Fuhrer in particular, that the thoughts of all my countrymen were with me in this fight. By the time of the second fight two years later, the world lay on the brink of war and the Nazis’ terror campaign against communists, socialists, trade unionists, the disabled, gays, Gypsies and Jews was underway. Schmeling and Louis were now political symbols for their respective countries whether they liked it or not and, as the fight on June 22 1938 approached, again held at New York’s Yankee Stadium, the tension far exceeded any that had been present in the lead-up to the first contest. Despite his message praising Hitler following the first fight Schmeling was not a member of the Nazi party and always denied Nazi claims of racial superiority. His wife and mother were prevented from travelling to the US with him to forestall the possibility of them defecting. His entourage included a Nazi official to handle press and publicity. It was this official who was responsible for issuing the infamous statement that a black man could not defeat Schmeling and that his purse would be used to help pay for more German tanks. As for Louis, he attended a meeting with President Franklin D Roosevelt at the White House prior to the fight, where he was left in no doubt of the importance of the outcome to the country at large. The irony was striking – a young black man whose people were being systematically denied their civil and human rights had become the champion of the country responsible. Louis was a different fighter to two years earlier. Since losing to the German in 1936 he’d gone on to win the world heavyweight title and successfully defended it three times. He was 25 and fully in his prime, which told from the opening bell when he went straight on the offensive, unleashing crunching combinations against Schmeling’s body and head. The German had no answer to the barrage and went down after just 90 seconds. When the action resumed, Louis picked up where he’d left off, again sending his opponent to the canvas. This time Schmeling’s corner, realizing their man was being taken apart, intervened to call a halt to what by now was a public execution. The fight was over in the first round, causing the 70,000 people crammed into the stadium to go wild. The victory propelled Louis to fame and celebrity, though he was studious in not displaying any of the defiance or controversy that typified the career of his black predecessor Jack Johnson. He knew his role and performed it to the letter, serving in the forces in World War II, in which his fame was exploited by the government in the war effort. He ended up broke as a greeter in a Las Vegas casino in his twilight years and died in 1981. Schmeling donated money to pay for the funeral and also acted as a pallbearer, testimony to the respect and friendship both men went on to enjoy after sharing the ring together. Schmeling returned to Germany after the fight to find his status had plummeted. The Nazis no longer treated him as a national hero or symbol of Aryan manhood – no great disappointment to the reluctant Schmeling. Indeed, the German champion provided sanctuary to two Jewish boys later the same year during the Kristallnacht pogrom against the Jews. After the war, during which he was conscripted to serve as a paratrooper, Schmeling embarked on a career in business. He died in 2005 just shy of his 100th birthday. 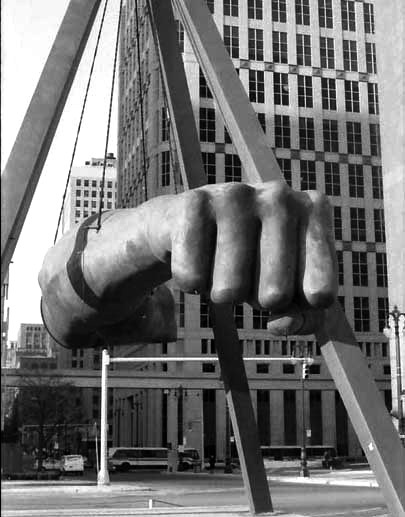 Photo: The Monument to Joe Louis, known as “The Fist,” is a memorial to the boxer at Detroit’s Hart Plaza. Dedicated in 1986, the sculpture was commissioned by Sports Illustrated magazine and created by Mexican-American sculptor Robert Graham. Graham referred to the sculpture as a “battering ram,” representing the power of Louis’ punch inside and outside the ring — his efforts to fight Jim Crow laws. Wikipedia, Einar E. Kvaran, fair use.